What If I Had Total Control? Have you ever wondered why the new STAR WARS movies were so terrible? After all, they had the same director who made the 1970s/80s originals. George Lucas put together some pretty amazing films. Yet, just a couple of decades later, Lucas came out with a new trilogy that didn’t live up to to the originals. What changed? The obvious answer, of course, is Jar Jar Binks. He definitely ranks as one of the worst decisions George Lucas ever made. Jar Jar is emblematic of the decadence of the STAR WARS franchise. Still, I can’t pin the ruinous execution of the prequel trilogy to one horrible, misguided character choice. After all, Mr. Binks hardly has any role in Episodes II and III, yet both of those films were pale shadows of A New Hope and Empire Strikes Back. To truly get a handle on why the new STAR WARS movies were so awful, we need to know something about the creative process that went into them. I recently learned in an amazing, 70-minute YouTube take-down of Episode I that George Lucas faced many challenges, restrictions, and setbacks during the production of the original movies. Because of technological, logistical, and economic limitations, George just couldn’t film the early movies the way he originally envisioned them. This was probably a really good thing. After all, did you know that Luke Skywalker was originally supposed to be a cyborg? And that C-3PO was supposed to have a voice and personality like a used car dealer? Thank goodness George Lucas didn’t get his way about everything! But in the more recent trilogy, he did. George had a huge budget, modern computer technology, and virtually unlimited creative license to do Episodes I-III just the way he wanted. 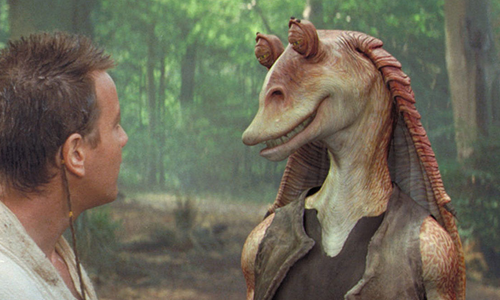 Jar Jar Binks, soulless fight scenes, and a nonsensical plot is what we ended up with. Lucas created the new trilogy with virtually no check to his personal vision, and the result was a sterile mess of computer-generated cartoons. None of this is terribly surprising. Most of us desire to be in control of our lives, and George Lucas is no exception. When he got the chance to exercise his creativity in the most unrestricted way possible he went for it. Who wouldn’t have? But the results of Lucas’ unfettered creativity are a reminder of just how detrimental it can be when there is nothing and no one to challenge our assumptions. As much as I hate having my ideas questioned and my plans foiled, I should be profoundly grateful for the people and situations that upset my creative vision. In a world without obstacles to my own ideas, my creations would be just as goofy and lifeless as Episode I. If I’m wise, I’ll practice gratitude for all the trials and difficulties that come my way. I’ll give thanks every time my plans are upset, my perfect vision thwarted. Because there is a better plan to be discovered, one that more fully integrates the wisdom and creativity of the people around me. I am blessed when I’m forced to slow down, collaborate, and compromise with others. When we slow down and work together, we end up creating a world so much more beautiful than we could have on our own. So, the next time I’m tempted by the desire for control, I’ll remember the lesson of Jar Jar Binks: Sometimes, the best thing I can hope for is some pushback. For a long time I’ve looked to the apostle Paul as a model for what my ministry should be like. Paul was an itinerant preacher who was immensely gifted at crossing cultural barriers. He toured the ancient Mediterranean, publicly debating with scoffers and establishing new communities of disciples. He founded countless local assemblies based on the sheer power of the gospel message. And then he left. Whether after days or months, Paul moved on. He appointed elders to care for the newly called out body of Christ in that city, and then he continued onward, to lay a foundation in the other cities and towns that had not yet heard the word. Paul’s ministry is deeply compelling to me. He’s an heroic figure who endured incredible hardship and violent opposition in order to share the gospel widely and establish new church communities wherever he went. I’ve often felt uneasy and disappointed with how little my own ministry so far has mirrored that of Paul’s. After all, I’ve done quite a bit of traveling in the last decade, but I haven’t done any miracles like Paul did. I haven’t started many new congregations. Measuring myself by Paul’s example, it’s easy to feel like a failure. But then, I ask myself: Why have I been so fixated on Paul as a model for my ministry? Without a doubt, Paul was an amazing minister, but there is an even better example for me to look up to: Jesus! Yeah, I know, it’s pretty obvious that I should look first to Jesus for inspiration. He is the founder of this whole God Movement, isn’t he? But, for a variety of reasons, I’ve often clung to Paul. I guess it feels safer to compare myself to him than to Jesus. Amazing as he was, he was still just a regular person like me, not the son of God. It feels overwhelming to think about my ministry in relation to the life of Jesus. That’s like getting on my old touring bicycle for a casual ride and comparing my performance to Lance Armstrong. Totally inappropriate. I’m not even in the same league! But it also makes a sort of sense, doesn’t it? 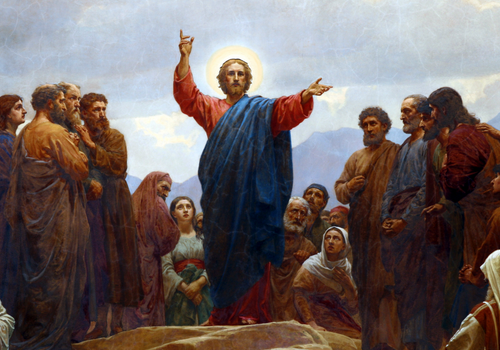 If I’m trying to follow Jesus, why wouldn’t I seek to emulate him, first and foremost? Jesus was the central focus in Paul’s life and ministry. Shouldn’t it be the same for me? This puts Jesus in a whole new light. Rather than looking at Christ’s ministry as exclusive and one-of-a-kind, what if Jesus is actually inviting me into his own journey? What if I embraced the kind of ministry that he modeled? As crazy as it sounds, Jesus himself said that in the power of his Holy Spirit we can do even greater things than he did during his time on earth. That’s phenomenal, isn’t it? We can’t just leave the heavy lifting to Jesus. He invites us into the same work that he did. With this in mind, I’m going to be studying Jesus’ life and message with new eyes. How did he carry out his ministry? What was Jesus’ model? Jesus didn’t plant churches. He gathered a tight circle of friends into a counter-cultural community that traveled with him wherever he went. In addition to this inner circle of itinerant Jesus groupies, he cultivated a dispersed network of friends and supporters throughout Judea. Jesus healed people. This was a huge part of what Jesus did. In fact, it would probably be accurate to say that Jesus’ job description was healer and teacher, in that order. During the three years of his ministry, this seems to be what he did all day long. When was the last time you saw someone healed at church? Jesus prophetically confronted injustice and corrupt institutions. As a result, he came under deadly attack by the powers that be. Defying the death machine, Jesus refused to compromise with the status quo. Instead, he taught his disciples a new and living way, completely at odds with the dominant culture. There’s a lot more to be said here, but I’d like you to join me in this conversation. What do you see as the marks of Jesus’ ministry? How can we as modern-day disciples follow in his footsteps, orienting our lives around the reign of God that he proclaimed and inaugurated? In the wake of the terror and tragedy of the shooting at Emanuel AME in Charleston, words fail. There’s nothing I can say that captures the gravity of the moment, the depth of the sorrow, the reality of the shock and anger. There is nothing left for me to say except, in the words of Job: therefore I despise myself, and repent in dust and ashes. How many times does this have to happen before white America wakes up? How many more black folks have to die so senselessly? How many more churches must be bombed? How many more of our brothers and sisters in Christ must be martyred before we white church people say enough is enough and put our feet to the pavement to enact a new political and cultural reality in our nation? How much more terror must be unleashed upon the people of God before I, and all my white brothers and sisters in Christ are ready to say, we repent in dust and ashes? This Sunday, my family attended two church services. We went first to a mostly white congregation; then, to a mostly black church. Both were mourning the terrorism in South Carolina. Both were worshiping God and drawing near to our crucified savior. But it felt risky to visit the second congregation. Why? Why did it feel like a big deal to visit my brothers and sisters across the street? Why did it take an unholy massacre in Charleston to move me to visit this church? When even the church of Jesus Christ is so sharply divided by race, how can we expect to be a witness to our violently racist culture? I have no answers today, only my solemn intention to repent in dust and ashes. I need to seek the face of the Lord for why I and my people have failed so miserably to live in the blood of Jesus, which breaks down the dividing wall of hostility between black and white folk. So long as white Christians fail to stand in solidarity, in true love and commitment with our black brothers and sisters, we are unworthy to call ourselves followers of Jesus Christ. This isn’t a guilt trip. This isn’t about feeling ashamed. That doesn’t help anybody. All white guilt does is focus our attention back on the emotional needs of white people, rather than looking at the concrete steps that we can take to participate in a more just order. That’s not repentance; it’s just self-indulgence. Genuine repentance means taking concrete steps to live a different way. It means acknowledging how we have allowed our sinful culture to blind us, ensnaring us in systemic racism and de facto apartheid. We’ve allowed ourselves to become inured to routine segregation in our neighborhoods and in the church. We’ve turned a blind eye to the steady stream of indignities, threats, violence, and terror that white America inflicts on our African American brothers and sisters. Our faith in Jesus was supposed to transform us, but instead we’ve become conformists. It’s not too late to turn it all around. We can still become the culture-confounding people that the gospel invites us to be. We can become the radical, anti-racist church of Jesus Christ. But it won’t be easy. The racist culture and institutions of our nation have been built up over 400 years. That kind of darkness doesn’t get cleared up overnight. Still, there are steps that we can take right now as we seek to be the repenting people of God. For me, an excellent first step was that simple act of worshiping with a predominantly African American congregation this Sunday. It was an eye-opening experience to be present with them as they began to process the acts of terror in South Carolina. I was humbled to receive their warm hospitality. Despite the fact that I, as a white person, could easily be viewed as a threat right now, they welcomed me with open arms. I have so much more to learn. What’s your next move? How will you participate in Christ’s ministry of reconciliation in this time of deep pain and struggle? What does it look like to repent in the midst of a society that is so steeped in institutional racism and generational injustice? How will we open ourselves to the power that Jesus gives to break down the barriers that bind us, to create one new humanity in the Holy Spirit? For me, and for my white brothers and sisters, first things first: Let us repent in dust and ashes. Pope Francis’ ecological encyclical comes out today, and there are many reasons for hope. It’s encouraging to see a such a high-profile Christian leader taking a strong stand on both ecological issues and those of global poverty. I’m grateful for the way F is intertwining care for the earth and social justice, a message which draws deeply from and amplifies Catholic social teaching. If we are to have a culture of life, it can’t stop with opposing abortion, capital punishment, and war. Our expression of Christ’s love must extend past personal piety and address the systemic sin that is increasingly tearing our world apart. Because climate change has long been positioned in terms of the religion versus science culture wars, framing the issue as a moral crisis is a game-changer. To have the Pope, by no means a liberal apologist, coming forward to address the ecological crisis is of profound significance. For the Pope to address climate change from the perspective of Christian discipleship is precisely what this global conversation needs. Such a move has the potential to break down the false science versus religion dichotomy that has for so long demanded that we choose between our minds and our hearts. It might even have the potential to soften ancient divisions within the worldwide church. Francis’ dynamic leadership prompts me to wonder anew about how the global body of Christ might be brought into unity. I have no illusions that the worldwide church will be re-united on an institutional level. (Even if it could be, there are questions in my mind about whether that would be a good thing.) Nevertheless, the humility, gentleness, and broad embrace of this pope encourages me to reevaluate my own sectarian tendencies, to seek more earnestly for ways to mend divisions wherever they estrange Christian brothers and sisters who desire to walk together in the way of Jesus. By choosing to focus on the plight of the poor and the groaning of the earth itself, Francis is tapping into something much deeper than denominational squabbles and political maneuvering. He is seeking to make an end-run around the tedious shouting matches of privileged contenders in pitched ideological battles. 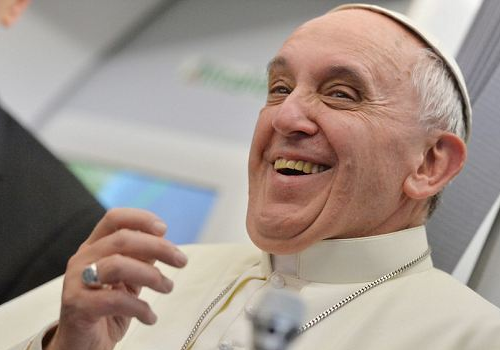 This is a pope, not of the pundits but of the people – and of the planet. We’re all connected. Just as the body of Christ is one – despite all of our institutional and ideological boundaries – all of humanity, all life is one. We’re rooted together in the soil that feeds us, in the natural ecosystems that sustain our very existence. Just as we cannot claim to be walking in the way of Jesus while ignoring the cries of the poor and oppressed, we can no longer treat care for the creation as a tangential issue. The earth is groaning under the futility that we have subjected it to. The plants and insects and trees and fish – all of life is our brother, sister, mother. When we sin against the natural world, we sin against our own body. It shouldn’t be at all surprising that a top Christian leader like Pope Francis is delivering a message of concern for the integrity of our whole planetary community, whether rich or poor, young or old, human or plant or fish or tree. This message flows organically from the heart of the gospel. Despite all the ways that Christians in the West have denied the goodness of God’s creation, the DNA of our story in Christ is one of profound love for the whole cosmos that God has made through his pre-existent Word. I anticipate Pope Francis’ second encyclical as an opportunity to more deeply engage with this gospel message, drawing us into reconciliation with all life. I’m praying that we’ll accept the invitation to explore our responsibility, as followers of the crucified Jesus, to respond to the cries of the poor and the natural world in whom Jesus is being re-crucified daily. How will we as friends of Jesus respond to this new teaching? Regardless of whether we are Catholic, Protestant, Eastern Orthodox, or some other weird group (Quakers, I’m looking at you) – how are we being called to open ourselves to the profound message that God is giving through his servant Francis? What would it mean to live at peace with one another, coming to know ourselves as one body in Christ, experiencing brother/sister-hood with all the living things that God has made? Is there anyone or anything you’d lay down your life for? Seriously. I know we’ve all got our priorities in life. Jobs, friends and family, religious and political ideologies – even the success of our favorite sports team! – can feel like matters of life and death. But are they? What would you actually be willing to die for? To answer this question, we’ve got to look at the heart of our lives, to those things that really endure. We ask questions like, What kind of person am I, really? What will I be remembered for? What do you worry about? What keeps you up at night? Where do you spend your most vital energy? Now, are those things that you’d be willing to die for? Do your daily preoccupations inspire life-and-death decisions? These things you spend so much of your time stressing over, are they what your life is truly about? Probably not. When your little life is drawing to a close, I doubt you’ll worry too much about whether you published that book or got that promotion. I suspect you won’t fret too much about whether you earned that degree or received that award. Your GPA will not loom large on the day of judgment. Answer that, and you’ll know why you’re alive in the first place. Care for the earth is a central concern for me. I believe that climate change may prove to be one of the greatest challenges that humanity has ever faced. I feel deeply convicted about humanity’s role in exploiting and abusing God’s creatures. The magnitude of the ecological crisis causes me to reflect on what my Christian faith really means in the face of such terrible challenge. Jesus is at the center of how I think about our relationship with the earth. His faithful life, death, and resurrection open up a way for me to have reconciliation with the whole of creation – the rocks, the trees, the rivers, the soil. Despite millennia of hostility between human beings and the rest of the natural order, Jesus makes peace through the blood of his cross. In him, there is power to overcome even the threat of climate change as we are reconciled to one another and our planet. Though Jesus is central to my own understanding of environmental justice, I’ve noticed that oftentimes my fellow Christians shy away from putting Jesus at the heart of our ecological witness. We refer back a lot to the creation stories in Genesis; we sing about finding God in the created order. The ecologically-minded church leans heavily on the primordial Creator God who said let there be light. But we hear less about the Redeemer God, whom we know in Jesus, brings about the Creator’s intention for a renewed humanity in a restored heavens and earth. The absence of Jesus in much of our ecological reflection plays into the existing theological and cultural divides that already exist within the church. The Evangelical wing embraces a theology centered in Jesus and his atonement, almost to the exclusion of the mysterious Spirit of God who hovers over the waters. This tendency within the church shies away from talking about ecological concerns for fear of veering off into paganism and earth-worship. Such mystery is dangerous. Meanwhile, mainline Christians are becoming increasingly comfortable with talking about the ecological grounding of our faith, yet we often eschew direct talk of Jesus Christ and his cross. The absence of Jesus from our ecotheology only serves to reinforce the Evangelical suspicion that environmental concern leads to idolatry and new age ideas. But we don’t have to be so divided. Jesus is fully human. He’s rooted in our struggle for wholeness and the redemption of the whole created order. In his body, the curse of ecological degradation is finally reversed. He invites us back into the Garden. I long to see a robust theology that draws on the wholeness of who God is – Father, Son, and Holy Spirit – as we consider the enormous ecological challenges that we face in the coming decades. If the we are to be faithful in this time of great darkness and despair, we must understand how the person of Jesus Christ – along with God Creator and the Holy Spirit – is alive and at work in mending the broken mess that we’ve made of God’s creation. How are you and your community wrestling with these questions? Is the ecological crisis on your radar screen? How are we as Christians called to enact our faith in the God who created the world that we are desecrating? And what about Jesus? How are his life, death, and resurrection relevant to you in this struggle? How does his gospel direct our response the rising tide that threatens all life as we know it? What Does Community Mean When People Keep Leaving? My wife Faith and I live together with two housemates. It’s great having other folks to share our home with, not to mention the gas and electric bill! I’ve always lived in some form of community or another, so it’s hard to even imagine life without anyone else in the house. Right now, though, we’re in a time of transition. Both of our housemates, within 2 weeks of one another, let us know that they planned to move out. That either of them would move out wasn’t surprising. It was always understood that they wouldn’t be with us forever. Still, it was rather startling to learn that both of them would be moving out this summer. This shift has me thinking again about the overall transience of our city – Washington, DC. Many people, especially younger people, come here for a relatively short period of time. We come for work, fun, and adventure. But very few of us come with the intention to stay. The fact that Faith and I have stayed in the District as long as we have is something of a miracle. I certainly didn’t think I’d be here for this long. With almost six years logged here in DC, I almost count as a veteran, at least among folks in my age range. Our city is often visited, but rarely settled. What does this transience mean for the possibility of being part of a long-term, stable community? What does community even mean in the context of the unceasing ebb and flow of arrivals and departures? What does it mean to be the church, the people of God walking in the way of Jesus, when it often seems uncertain how long any of us will be here? I don’t have any answers to these questions. I invite your thoughts and wisdom into my perplexity. Does community require stability, or can real gospel life be sustained even in environments of great upheaval and disconnection? How does that work? What does it mean to walk together as friends of Jesus in the midst of so much hustle and bustle?